Is Being an OAP a Badge of Courage? Recently, I’ve noticed a huge influx of men and women putting themselves in the exclusive OAP group as if it is a badge of courage. OAP stands for only active parent, which means the other parent is not active from a relationship or parenting angle. The majority of parents in many OAP groups are women, which means there are no male parents in the children’s lives – should OAP parents wear this fact on their sleeve as a badge of courage? Many OAP forums, blogs and groups have tag lines that talk about the good things and bad things about being an OAP parent. One in particular talks about how OAP parents don’t get the luxury of shared holidays or breaks from having kids around the house. These tag lines seem a little counterproductive to the OAP badge – in a two-parent household there are no shared holidays and the kids are always around. There’s no other parent sitting in wait to take the kids off your shoulders for a few much needed days of rest and relaxation. Life as a parent means living as a parent for life, no matter if the other parent is around or in the wind. It’s simple to find tons of negative forum posts and blogs about dads missing from the equation, but I was also able to find positive, understanding mentions of how OAP moms should treat the other half – families with only dads or with both moms and dads. The blogger posted a story about father/daughter dances. The dances were cancelled at a local school because not all children had dads at home and someone complained about the dances not being fair to all children – thus, no children could participate. According to this particular OAP mom, the dances should have been left as is so some of the children could enjoy a special moment with their dads. I remembered the first father/daughter dance my daughters attended and realized there was no mother/son dance offered for young boys – no one complained. Being an OAP parent may be a badge of courage for some men and women, but just because life threw a bad ball doesn’t mean families with both parents have to suffer the consequences. 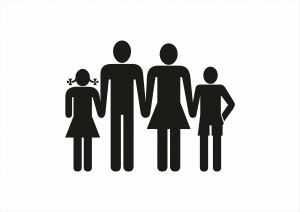 OAP parenting, unfortunately, also occurs in two-parent households – just because there is a dad in the household doesn’t mean that dad is active in parenting. Being a strong, active, supportive parent is a reason to wear that badge of honor – but just because you are the only active parent in a relationship doesn’t mean you have reason to put down two-parent households.